And opening for John Hiatt, no less--would I like to see the show? Hell, yeah, I'd like to see the show. Kevin's a real prince, he's got the day off, so he even comes down to see me and my new duo partner Peter Cronin open the summer debut of Shakespeare in the Park, yikes. A technical disaster, bad idea to play the very first one. Thankfully, Kevin gets there toward the end of our little set, when the sound company is starting to get it right. Next day, a cyberfriend from outta town is in for the day, so we catch Jim Lauderdale playing for free up at Opry Mills with a great bluegrass band, then beat it down to the Ryman. The seats are ten rows back, and ten seats stage left from center, nice. 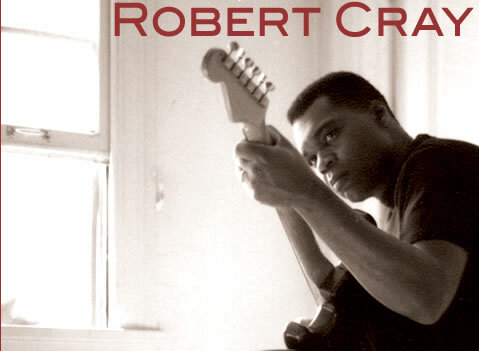 I've always dug Robert Cray's records, but in concert it was so much more. Some musicians play the guitar, and some simply are the guitar, and he's in the latter camp. His quartet is deep. Jim Pugh on keys has got it all goin on, many styles of piano come and go for what's supposed to be a blues show, and a mega-timbred organ approach further expands the band's reach. But any Cray fan knows that blues is just home plate for this outfit, and that they're running the bases all night. Kevin Hayes on skins and Karl Sevareid on bass are as tight and musical a rhythm section as you can find anywhere, these guys have played together a long time. Our thanks to Kevin and his publicist Cary Baker for helping us line up a friendly conversation with Robert Cray. He's a very refined and worldly person, a real pleasure to interview.